Considered the ZM Core Business, the process of Cold Forming gives the name to the business that produces cold forged special components. The production process of Cold Forged Parts is quite vertical and begins in the treatment of raw material with fosfate bath, heating treatment and wire drawing. In the manufacturing large horizontal presses of multiple stages are used. There are also vertical, hydraulic and mechanical presses, with capacity to reach 600 tonnes. The ZM has technology to develop and produce internally all its tooling, which offers greater speed and adequacy of the tool with all the equipment inside the production. 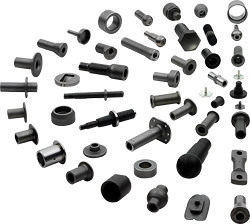 The ZM Cold Forged Parts are provided for major automotive industries, both for the OEM market (original) and for the spare parts market (Aftermarket), and cover several segments, such as electrical, suspension, steering, traction, brakes, fastening, among others.